Matt Smith is turning out to be an excellent Doctor. 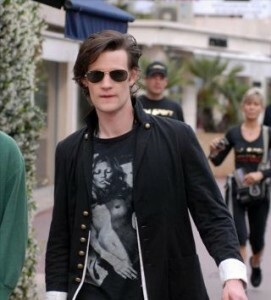 He has a serious cool factor about him, but in real life, Matt is cool and a bit clumsy. During the filming of the series, in particular, the 4th episode that features the Weeping Angels, Matt had a rather humorous event that was included in the actual Doctor Who show. Apparently, Matt was hanging from the ceiling by a strap when the strap broke and he came crashing down to the ground. Mr. Smith was not injured and writer/producer Steven Moffat insisted that the scene be re-shot and include the “fall”. I am interested to see the scene in the upcoming episode, “The Time of Angels.” Along the lines of clumsiness, I am also interested to see how Matt Smith’s lack of dexterity will influence more future scenes of the Doctor Who series. Look at the Walesonline.com article for more details. Posted: 04|28|10 at 10:52 am. Filed under: New Doctor Who.